Your learning program has been managing itself for years, or at least that’s what your boss thinks. But you know the dark secret that is lurking barely below the surface. You spend a ridiculous amount of time organizing and determining methods of learning dispersal among personnel within your organization. You are so swamped with the follow-up work that your other responsibilities are more and more stressful. So, with your business growing and your sanity going further and further by the wayside, how do you convince your boss that there is a better way? We are here to help. Like in most buyer scenarios, the best way to relay the importance of the investment is in a fiscally responsible manner. With a clear roadmap on effectively moving your organization to the finish line. Let’s face it. Learning programs are resource intensive. In order to properly organize a blended learning environment without a learning management system, a great deal of time needs to be dedicated. The great thing about an LMS is that the bulk of the work is done up front. All the employees are loaded into the system, and new ones can be auto-imported via a connection with your HRIS. This means that once you have gotten past the implementation your program will basically run itself, giving you time for implementing new courses, analyzing the effectiveness of the programs you have in place, and thinking up methods to improve organizational learning as a whole. The cost of the learning management system aside, an LMS is basically like hiring a full-time planner for your learning program. 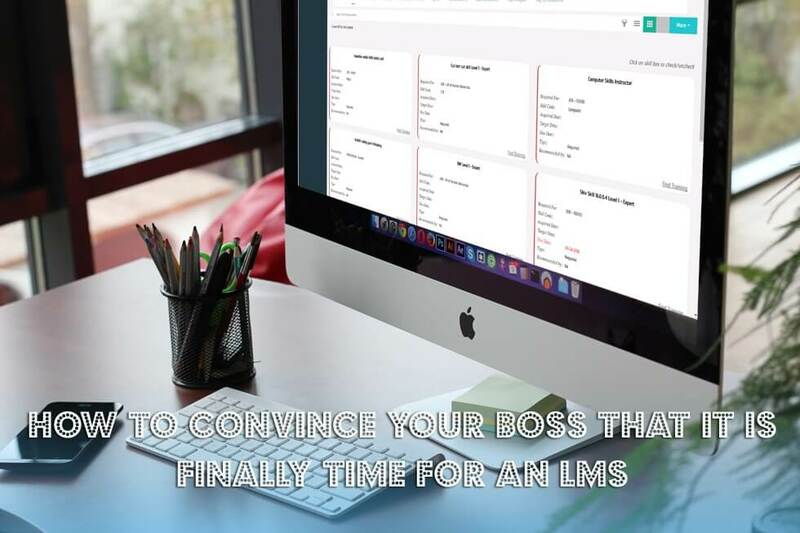 The organization of an LMS also frees up time for your instructors, allowing them to deliver learnings on a more impactful scale and the tools to verify session availability in reference to other teachings within the organization. Further alleviating redundancy and scheduling conflicts. Sure, your staff is undergoing your training, and it seems to be working. But, wouldn’t you like to be able to show your boss directly how effective it is? These reports are just a click away! See who has taken what course, how well those individuals have done within those courses and areas in which your employees will need to improve to positively benefit the business. No more excuses. Everything is laid out in front of you learners. Your personnel will be able to call upon their learnings whenever they need, as well as relaunch past training to obtain a stronger understanding of portrayed concepts. Employees can also observe gaps they need to overcome in order to obtain the greatest benefit from their personal training and development. All of your learnings via one portal. Imagine scheduling instructor-led training from the same location that you provide your employees a running stream of e-Learnings. How are you ensuring that your employees are taking the courses now? How are you reminding them to finish coursework that is outstanding? Are you even sure that everyone is taking all your learning offerings? With an LMS, you can automate your reminder system, you can look at untaken curriculum all from one screen and quickly identify holes in the curriculum. A learning management system is a tool you need to overcome issues you are currently experiencing within your learning program. An LMS provides the resources for appropriate audit trails. We all know that non-compliance with industry regulations costs serious money. So why not ensure your output is in accordance with the demands of the strict regulations that are imposed on your learning and development program? When it comes time to produce documentation on the number of compliance certifications various departments have undergone, you should not have to scramble for the information. Safeguard your learning program with an adaptable LMS today. Increased productivity from your HR personnel and general users within the system. As well as better quality control of the learnings you are providing. No more troublesome fines and penalties stemming from the inability to report safety learnings in a timely and verifiable manner. Reduce the lost time in redundant training sessions and validate the effectiveness of the programs your learning program undergoes. You may find that learnings which you have spent a good deal of money creating are less beneficial than an in-house offering that has been going around the office place for years. You shouldn’t have to do this all on your own, call your Gyrus Systems representative today. We’ll gladly make the business case for why your organization should opt into an LMS today. Save time, be more productive and reap the benefits of a greater learning environment. We can help you evaluate shortcomings in your current training environment, and clearly outline the savings you will enjoy from effectively implementing a Learning Management System. Be sure to join us as we further investigate the LMS marketplace and make suggestions from time to time for making your professional life easier.